This full-body child manikin has been created to offer realistic training and practice of child airway management and CPR education. The Basic Life/form® Child CRiSisTM Manikin is anatomically correct in detail and represents the size of an 8-year-old child. Realistic anatomy and landmarks include a mouth, tongue, oral pharynx, larynx, epiglottis, arytenoids, vocal cords, trachea, and esophagus. In addition to the palpable and visual landmarks, the head, neck, and jaw are fully articulated, allowing a realistic jaw thrust feature. This manikin has separate left and right lungs for auscultation; has oral, nasal, and digital intubation capabilities; and includes an inflatable stomach bladder to indicate esophageal intubation. Also features E.T., E.O.A., P.T.L., L.M.A., E.G.T.A., and Combitube® Insertion. 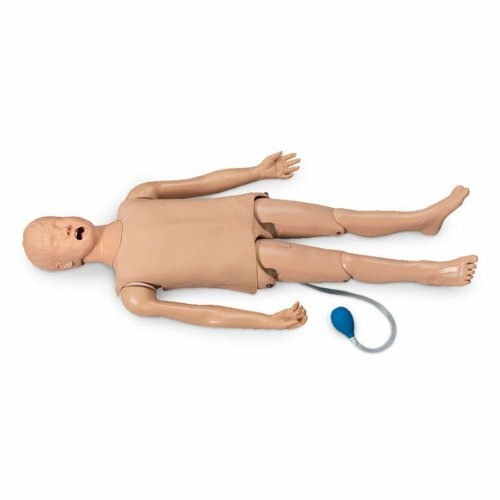 This basic airway management trainer may be gradually updated to the Life/form® Child CRiSisTM or Deluxe Child CRiSisTM manikins by adding the available upgrades and the Interactive ECG Simulator (NA- LF03670U). Includes pump spray lubricant. 5-year warranty.